Taken together, the Mess Mapping™ and Resolution Mapping™ processes described here should produce clarion calls to action. They each provide antidotes to common workshop problems, for example, brainstorming meetings that feel good, but that lack rigor, and consequently fail to produce action and results. Or even worse, BOPSAT: a Bunch Of People Sitting Around Talking. Instead, Mess Map and Resolution Mapping workshops are powerful tools for stakeholders to identify the complex patterns that are an essential aspect of Social Messes. 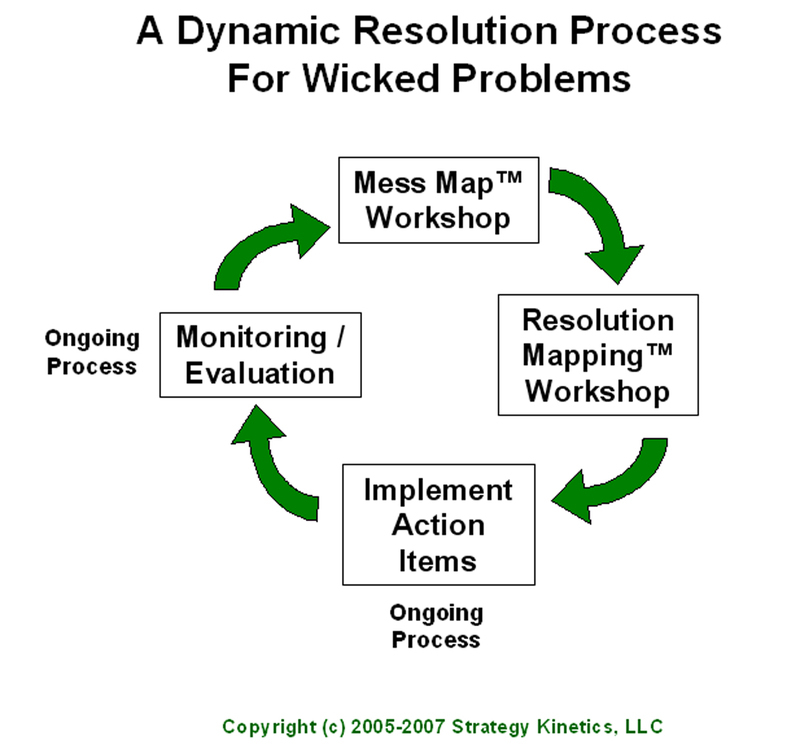 Action, and not analysis per se, is the key to resolving Wicked Problems. As Rittel and Webber noted in their defining 1973 article, Wicked Problems are never solved, but “re-solved” for a time (Figure 17). Action plan implementation is an ongoing process. In time, the state of the systems that comprise a given Social Mess will change, in part because of the actions taken by stakeholders and in part because everything changes. Change is integral for interconnected complex systems that comprise Social Messes. To paraphrase Heraclitus, it is impossible to step into the same Mess twice. In addition to integral change and successes resolving Wicked Problems, stakeholders change. Co-workers come and go. Funding appears and disappears. New products supplant the old. Political, social, cultural, technological, and economic contexts all change as well, usually quite independently of actions to address a given Wicked Problem. Workshop outputs such Common and Unique Event lists may be used as the foundation of a war room or Event Dashboard for tracking the evolution of a given set of systems and problems against the desired Endstate. As a result of change, organizations concerned with a given Social Mess must re-learn, re-evaluate, and re-resolve the Wicked Problem at hand (Figure 17). The systems that comprise a Wicked Problem have evolved; the stakeholders have evolved. If the rate of change is modest or the time period short, the previous analyses, conclusions, and key action items may just need a tune-up, so to speak. If change has been fast or there have been perceived inflection points or discontinuities, then stakeholders may benefit from a much more substantial re-analysis. Regardless, stakeholders need to keep reminding themselves that individual and organizational learning requires a conscious and sustained effort.